Make delicious peach margaritas and peach daiquiris at home with Mayson's Finest Peach Puree. Enjoy a frozen peach margarita or daiquiri as delicious as the ones that you have at your favorite restaurant. Or make a tasty virgin peach margarita on the rocks to serve at family friendly parties. Combine Mayson's Peach Puree with another one of Mayson's Fruit Flavors, such as Mayson's Mango Puree, to make a multiple fruit flavored margarita. For additional margarita recipes and information on how to make a margarita, click here. Mayson's Peach Puree is a concentrated cocktail mixer – each liter makes over 20 drinks. Thirsting for the nation's best margarita mix? 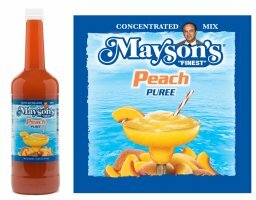 Liters of Mayson's Peach Puree are available for purchase via our online store. Would you like to find Mayson's at your favorite local store? Click here to let them know! Want more margarita recipes? Click here for more suggestions on how to make the best margaritas.